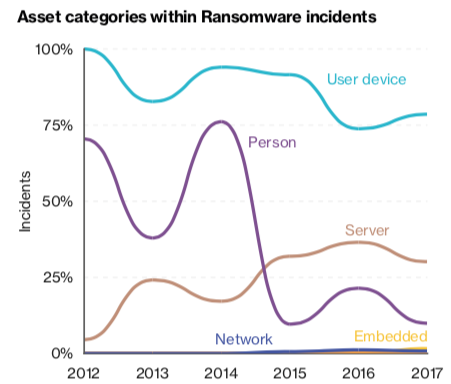 By targeting a larger number of devices and more important systems within an organization, attackers can demand bigger ransoms. According to the latest DBIR, financially-motivated attacks remain the most common and accounted for 76% of breaches analyzed in 2017. Cyber espionage is the second most common type of attack, accounting for 13% of breaches. Nearly three-quarters of attacks were conducted by outsiders, half of which were organized crime groups, and 12% were state-sponsored threat actors. Almost half of the attacks analyzed by Verizon involved hacking and 30% relied on malware. One in five incidents involved mistakes made by employees, including misconfigured web servers, emails sent to the wrong person, and failure to shred confidential documents. While 78% of employees did not click on any phishing links, 4% will fall for any given campaign. This is a small percentage, but one victim is enough for an attacker to gain access to an organization’s systems, Verizon warned. The telecoms giant also revealed that the number of incidents involving pretexting has increased more than five times since the previous DBIR. Of the 170 incidents analyzed in 2017, 88 targeted HR staff with the goal of obtaining personal data that could be used to file fraudulent tax returns. Both an executive summary and the full report are available directly from Verizon in PDF format — no registration is required.